The ultimate aim of IUPAC nomenclature is to provide unequivocal and comprehensible names for all kinds of chemical structures. This requires a rational basis from which comprehensible names can be developed. 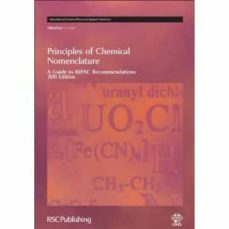 Written by leading world authorities this second edition of Principles of Chemical Nomenclature outlines IUPAC recommendations for application in the principle branches of chemistry: organic, inorganic, organometallic, and polymer. It also includes some basic biochemical nomenclature. The book clearly explains the fundamental principles of nomenclature methods and enables the reader to apply them accurately and with confidence. New developments are described and additional nomenclature systems used in specific industries are introduced. The book is replete with examples for guidance and there are extensive tables to direct the reader to information quickly. Aimed at chemistry teachers and students at all levels, it advises on the best presentation of formulae and chemical graphics. Although rather advanced for school pupils, their teachers will find it useful.